The snow crab is a crustacean found mostly in the waters between Russia and Alaska known as the Bering Sea, though they can be found in the northwestern Atlantic Ocean no farther south than Maine. The snow crab is an excellent source of protein and is generally low in fat. Snow crab legs can be cooked a variety of ways, including steaming, boiling and grilling. Sometimes oversteaming or -boiling the crab legs can soften the shell, making them difficult to crack. Baking them in the oven will keep the shell from softening, making them much easier to crack. Allow the snow crab legs to thaw in the refrigerator overnight. Remove the crab legs from the refrigerator prior to cooking. 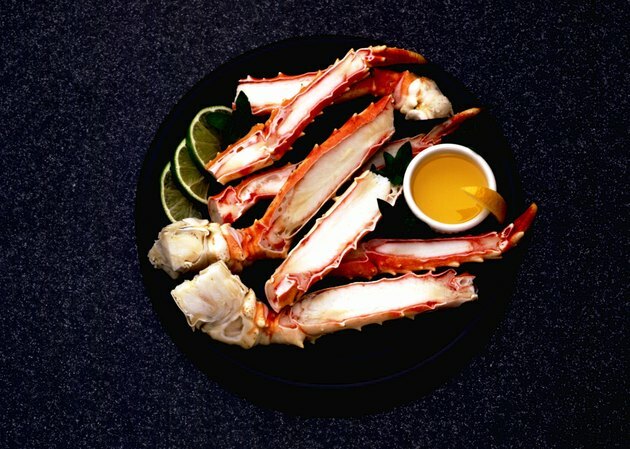 Arrange the snow crab legs in a single layer in a large baking dish. Pour 2/3 of the garlic butter over the crab legs. Place the baking dish in the oven and bake it for seven minutes. Turn the snow crab legs over and pour the rest of the garlic butter over them. Bake them for another seven minutes. Remove the snow crab legs from the oven and serve them.